My C.A.S.E. Studies: YNS Christmas New Release Blog Hop! Hello everybody! 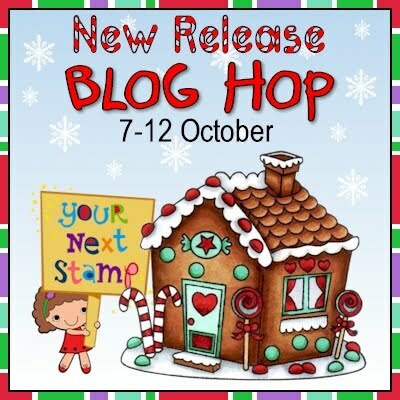 Thanks for joining us for another fun and fabulous Your Next Stamp Blog Hop! YNS just released over 25 new holiday images so the Starlets (and our awesome guest designers!) have whipped up some eye candy using many of the new images. If you came here by way of Jenny's blog, then you're on the right track! If not, please go back and start at Crystal's blog because you won't want to miss a stop! Not only are there amazing projects for you to drool over, but there are also super prizes!! At the very end of the hop, there will be a chance to win the grand prize surprise new release package. BUT don't go directly there yet because there are also several stops on the hop with mini candy draws - you'll have to keep hopping to find them all! By the way, there's also a 15% off sale during the duration of the hop so you'll be able to go shopping for all these new releases, and other stuff too if you'd like! I stamped the image on white cardstock and colored with colored pencils and odorless mineral spirits. Next I masked off the image and airbrushed the background with Copic markers. My last marker spit big spots in areas so I decided to cover them up by sewing on seed beads everywhere to represent falling snow. The background was embossed with a Spellbinders snowflake plate and then I attached tiny snowflake punches with sewn seed bead centers. Finally I added some white satin ribbon and some hand dyed seam binding. It's basically a box that opens at the top so you can stick a battery powered tea light candle in to light it up. There's an insert in there so that the light stays right behind the fire even if you move the fireplace. I also designed a stencil to sponge all the bricks on and I even designed the little fire! For the garland, I just punched out the little fern from a few different shades of green cardstock, and then hit them with a little green ink on a stencil brush so they weren't so flat green. To get them in the garland shape, I actually stamped the larger light string from the set, then just cut around the "string" to get a base to glue on my fern branches. Then I stamped the little lights twice, colored eight of them with Copics, cut them out and covered just the bulb portions with clear dimensional adhesive. Finally I glued the lights behind the garland and added 2 little bows of red baker's twine. I hope you liked my projects and thanks for hopping along with us! Your next stop is our incredibly talented October Guest Designer Tori. love your little chimney box. Really amazing! The chimney box is more than fab! Maureen!! that fireplace is FAB! How adorable is that?!! And you are quite the colorist - your chimney mouse card looks like it was professionally printed. WOW! Wow! So cute! I really love that fireplace. Oh I love these! the mouse card is precious and I'm dying over your light up box! What a fun idea!! Your coloring is simply wonderful on the card - outstanding! And that fireplace is adorable - the string of lights is just so very cute. These are gorgeous projects!1 I so love your fireplace with the lights and the vine! Your mouse on the blue is darling!! wonderful projects... love your fireplace idea. OMG! Maureen your projects are fabulous! That Merry Mouse card is stunning and I so need to learn how to use pencils and the falling snow is the perfect touch! That fireplace is so fun! I love it! These are great. I need that mouse stamp so bad! Speechless!! Really I cannot believe the amount of work you put into these!!! AMAZING projects!! Love the night sky with the card, and your box....Is a work of art!! Love it!! WOW, Maureen!!! So super creative, girl! I love your coloring and airbrushing, and that fireplace ROCKS!!! These are FANTASTIC Maureen and sooo creative!!! Love the fireplace! What a great idea! Cute projects! The fireplace is such a clever idea! Love the mouse! Great way to "disguise" your splotches with seed beads. They look totally deliberate. Great projects! I love the little fireplace. That fireplace is gorgeous. You are amazing girlie! Love the blues in your card! Great work! Both are gorgeous, but that little fireplace is so creative! Awesome job! Never thought a little mouse could win my heart, but...he is adorable! Great projects--I really like your fireplace!! Oh that fireplace is fabulous Maureen! I love the garland with lights!! So, SO cute! I love the chimney! Thanks for sharing! Fabulous projects, Maureen! Love the fire place especially! So creative! I love those Christmas lights! Cute!